NYTimes: ''MANHUNTER,'' Michael Mann's adaptation of Thomas Harris's novel ''Red Dragon,'' may not persuade you that its hero, the F.B.I. agent Will Graham, operates on the same skewed wavelength as the cracked killers he specializes in tracking down, but the movie drives along with such intensity for much of the time that you can just let it work on your senses without worrying about whether it makes sense. 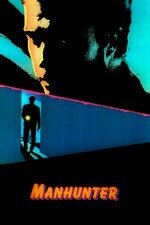 RogerEbert.com: A feature-length riff on Nietzsche's old quote about looking long into the abyss, "Manhunter" is a moody, sorrowful picture about a man consciously uncoupling himself from domestic comforts in order to become that which he must destroy. Played in one of those pushy, mid-eighties William Petersen performances that's a bit too much while being just right (see also "To Live And Die In L.A.") Graham is retired when the film begins, scarred both physically and mentally after a scuffle with everybody's favorite epicurean shrink. AV Club: Mann and cinematographer Dante Spinotti color-codes Graham’s home life blue, while his nemesis/spiritual twin, serial killer Francis Dolarhyde (Tom Noonan), lives amid magenta and uneasy neon green. Combined with scenes set in Florida (it wouldn’t be a Michael Mann movie without a beach house) and Mann’s infatuation with postmodern design (the High Museum Of Art in Atlanta stands in for a maximum-security prison), the color scheme makes Manhunter look dated at times. But it’s debatable whether Mann, executive producer of the hugely influential Miami Vice, was simply reflecting or actively creating the aesthetic moment. In other words, does Michael Mann look like the ’80s, or does the ’80s look like Michael Mann? Definitely the best looking prison ever. And so very *very* mid-80's. This movie has the best THE BEST soundtrack. Go spend your day listening to it on repeat. I like how Mann makes crime/genre movies that are really personal and involved in the inner emotional lives of their characters, it feels literary rather than bombastic. Also interesting to see a "serial killer investigation movie" before all those tropes and motifs got codified and settled down. As previously noted on MF Matthew Morretini has done a cut-together of the 'Graham's prison interview with Lecter' scene from Manhunter, Red Dragon and Season 3 of Hannibal. Three different interpretations of Lecter, but in many ways the Mikkelsen/Dancy version, whilst superficially taking the greatest liberties with the original scene, is actually truer to it than the version in Red Dragon was. Manhunter isn't perfect. Denis Farina is good, but he's not Jack Crawford, and there's a happy ending achieved by jettisoning the actual shock ending of the book (which is one thing Red Dragon didn't do.) But William Peterson and Tom Noonan are fantastic, the soundtrack - disregarding the rather upbeat end title - is perfect, and the visuals were ground-breaking. Manhunter looked like little before it, but an awful lot of what came after looked like Manhunter. I quite like this movie. Cox's Lecter (or "Lecktor") was overshadowed by Anthony Hopkins' in The Silence of the Lambs, but then again Hopkins' performance in that film was overshadowed by the later ones--if you like a slice of cheese on your hamburger, you'll love half a pound of the stuff, right?--and Cox seems almost refreshingly restrained by comparison. He gives Lecter a very workmanlike manner that's jarring with both the nature of his own crimes and those of the guy that Graham is chasing.